If you're ever in the position that Tom Hanks was -- talented actor making a writing and directing debut to a world of cynical audiences and critics -- pray that you're as smart as he was. That Thing You Do!, while neither an important nor an outstanding film, does everything it sets out to do without embarrassing any of the parties involved. The actors got high-profile exposure, Hanks got to write and direct a film, the studio gained the favor of one of the most marketable actors in Hollywood, and even Peter Scolari got a part. Tom Everett Scott stars as Guy Patterson, son of the local appliance shopkeeper and moonlight percussionist. When the store closes, the hi-fi becomes his accompaniment, and he plays along with the greats while he should be counting the store receipts. All that changes when he¹s approached by a nameless local band looking to replace their drummer for a college talent night. Although he can play the band¹s big song, a slow, teary ballad called (gasp) "That Thing You Do," it's clear he's not impressed with it or its writer, Jimmy. Jimmy, a temperamental artiste, tells Guy to just play, and it's off to the talent contest. Once on stage, it's Guy's turn to be temperamental, and he speeds the tempo of the song until it becomes that peppy, upbeat tune you recognize from the radio and countless previews on TV. The band, now named the One-ders (regularly mispronounced "Oh-need-ers") is a complete success and wins the contest, plus regular gigs at the local pizza joint. From there it's only a matter of time before they're picked up by a manager, and finally by Play-Tone records, under the supervision of the supercool Mister White (played by Hanks himself). White tells them they're going to be "a part of the Play-Tone galaxy of stars," but insists they ditch their name in favor of "The Wonders." ("As in: I wonder what happened to the Oh-need-ers?") Along the way, members of the band find time to fall in and out of love, join the Marines, and visit Disneyland. The best scenes in That Thing You Do! arise from the sheer amazement and joy expressed by the band members at their sudden success. When their song first hits the radio, Guy and his cohorts (including Jimmy's girlfriend-doubling-as-roadie Faye, played by Liv Tyler) dance around the appliance store in obvious, infectious elation. How can we not be happy for them? "Have I told you you look good in red?" Fortunately, the eventual end of this bliss isn't too weighty. When Guy has his inevitable letdown towards the end of the film, the feeling isn't of a crushing defeat, but of the knowledge that the Wonders' success was obviously too good to last. Of course, in a feel-good film like this, true love is destined to save the day, and "where-are-they-now" captions are destined to roll. 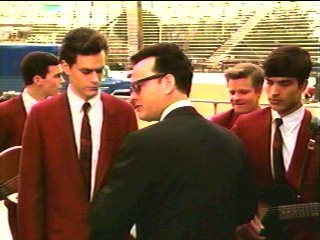 According to Tom Everett Scott's biographical entry in the IMDB, Hanks was initially against his casting, because he's a dead ringer for Hanks' younger self. Hanks' wife, the alluring Rita Wilson (who also shows up briefly in the film in a killer dress), convinced her director husband to cast Scott in the part. Unfortunately, something rubbed off on the set, because Scott manages to incorporate every Hanks trademark idosyncracy possible into his performance. Between Hanks' signature eyebrow-raise to his jerky body language, it was tough to find something in Scott's portrayal of Guy Patterson that didn't remind us of Tom Hanks. It's a good thing Hanks is endearing -- imagine if Scott had decided to emulate, say, Rodney Dangerfield. As a first time film for one of the best actors working today, That Thing You Do! is a complete success. Sure, it's not the deepest movie we ever saw, but it's nice to see that someone knows his limitations. Plus, he has a terrific sense of pop culture and recent film history: how else do you explain the casting of Clint Howard and Gedde Watanabe? Hanks has decided to start small: That Thing You Do! is to his directing career as Bosom Buddies was to his acting career. Let's just hope the directing career gets to its Philadelphia or Forrest Gump in its own time.